I hope this weekend brings a little time for myself. The past two weeks has been filled with overtime (seven hours plus), little sleep and stress. The extra money from overtime is great but after five hours, I’m wishing I had the day off. Further I think the tendonitis in my wrists are coming back from banging my keyboard so much at work trying to figure out the new design program and the new bastardized form of OSX. My eating habits? Crap. Haven’t eaten very well and living on cereal, yogurt and even had a California burrito (something I haven’t had in a few years for the obvious health reasons). Living in Nebraska? View the sampling below. Guaranteed to shorten your life. 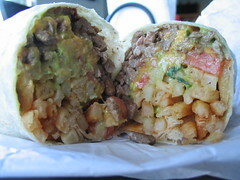 A California burrito consists of carne asada, cheese, guacamole and french fries. 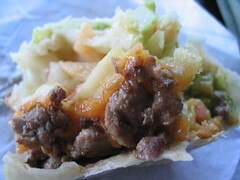 Many places in central San Diego have their own version of the California burrito. 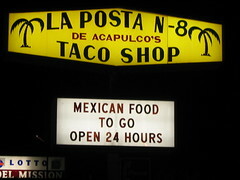 The best place, hands down, is La Posta. It’s especially busy in the wee mornings after most clubs have closed. One last parting shot of the infamous California burrito. holey moley that is a wicked blog overhaul.California burrito… mmmmmmm.